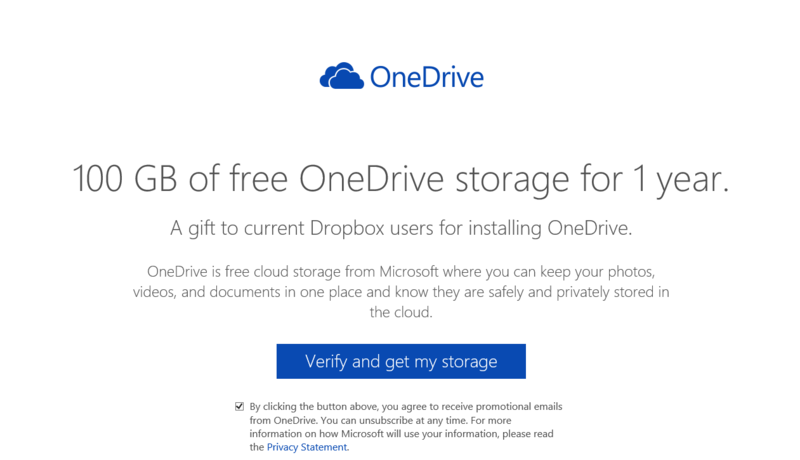 Microsoft continues to give away OneDrive storage like it is candy. Earlier today I post about Bing Rewards customers globally getting a free 100GB of storage just by signing up. Now Redmond has extended an offer of an additional 100GB of storage for those of you with a Dropbox account. While Microsoft and Dropbox have done a lot of work together over these past few months including bringing an official Dropbox app to Windows and Windows Phone 8.1, they are still competitors and Microsoft clearly is showing they intend to win as many customers to their cloud storage service as possible. Here is the deal: First, you have to have an active Dropbox account. If you don’t have one because you already use OneDrive, no problem. Go open a free 2GB account at Dropbox. I’ll wait while you go do that…. Now, go to this link and sign up for the bonus to get 100GB of free OneDrive storage for a year. You will have to store a file on your Dropbox account by signing in with your Dropbox account information. Once you save that Getting Started with OneDrive file in your Dropbox (yes, I thought it was a great title for the document too) you will have the extra 100GB of storage for a year. Peeps, let us recap shall we the amount of free potential storage you have with OneDrive right now. A free OneDrive account automatically gives you 15GB of storage. That’s just for signing up. If you sync your Windows Phone, Android or iOS device with the OneDrive app to save photos to your OneDrive automagically, you get another 15GB free. Sign in with your Dropbox account and save a file to it from OneDrive and you get 100GB for free for a year. All told peeps that is 230GB of storage. Free. It is kind of a no-brainer. To get that amount of storage on Dropbox by-the-way would cost you $9.99 per month as you would have to move from the free 2GB account to the 1TB account on their service. So let’s do a stare-and-compare on the $9.99 per month. That’s what Office 365 Home costs per month. That gets you Office on the web and installed on up to five PCs, Macs and various mobile devices. Plus you then get unlimited storage on OneDrive. Any other excuses you can think of not to try OneDrive? I didn’t think so.